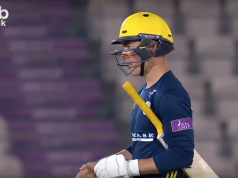 England Test captain Alastair Cook endured a miserable return to competitive cricket after his axing from the ODI squad in the Champion County match between Yorkshire and the MCC. He had already lost his opening partner Nick Compton, who had edged an uncharacteristically loose drive to Jonny Bairstow off the first ball of the match, when he was given out lbw for three to give Ryan Sidebottom his second wicket. Compton’s decision to bat first appeared dubious with the MCC at 7-2, but Sidebottom’s new ball partner Jack Brooks struggled to control his line and especially his length, and gave free boundaries to Michael Carberry and James Hildreth, who staged an impressive recovery with a partnership of 74. With the scoreboard on 81-2 and 36 runs to his name, Carberry’s frustration at the economical bowling of Steve Patterson caused him to attempt an ill-advised cut shot, which he hit to Adam Lyth at second slip. After lunch, Hildreth continued his fine scoring in another big partnership with Worcestershire captain Daryl Mitchell, but fell short of his 31st first-class century when he was out lbw to Tim Bresnan on 89. Mitchell overcame some early nerves to pass fifty shortly after Hildreth perished, a lucky inside edge off Patterson bringing up the milestone. Soon after, however, Mitchell became Will Rhodes’ first victim in first-class cricket, and an MCC collapse ensued. Brooks made a triumphant return to the bowling attack, removing Billings and Rushworth (both for 0), and Rhodes got Graham Onions lbw for one. Adil Rashid cleaned up the tailenders after the second interval to leave the MCC 221 all out. There was bad news for Durham as Onions limped off with a groin injury midway through the seventh over of Yorkshire’s reply. He is going to be reassessed tomorrow to see if he can continue with the match. Batting under lights, Yorkshire’s opening duo of Lyth and Lees negotiated the first few overs well, before Lees nicked off to Dunn on 11. Jack Leaning joined England’s latest recruit at the crease, and although he made an encouraging start, he prodded an innocuous delivery from Zafar Ansari to Mitchell at slip. Patterson came in as nightwatchman, and Yorkshire reached 82-2 at stumps with Lyth unbeaten on 53. Lyth is expected to be the reserve opener for England’s tour of the West Indies, with Jonathan Trott likely to join Alastair Cook at the top of the order. However, it appears that Lyth has picked up from his excellent form of last season, and if you consider for a moment the question of whether he or Cook would score more runs for England this summer, the current evidence looks bleak for the captain. Certainly, their diverging fortunes in this match won’t have escaped the attention of the England selectors or the cricket media. 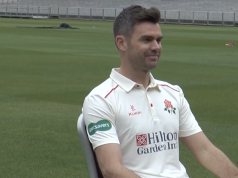 The pitch was fairly slow and, according to Ryan Sidebottom in his post-day interview with the BBC Yorkshire’s Dave Callaghan, the pink ball wasn’t giving the bowlers a lot of assistance. There appeared to be some turn in the pitch for Adil Rashid and Adam Riley late in the day and that is likely to get more pronounced as the match goes on. Needless to say, Alex Lees will be the happier of the two team captains with the day’s proceedings. The least happy captain in the match, however, will undoubtedly be England’s.